Spike traps are one of the most enjoyable and easy to use items in Fortnite, they do a ton of damage and are easy to conceal in houses, caves, and self-made forts. They aren’t used as much as they should be in my opinion and this guide is here to help change that. The Fortnite spike traps are just like bounce pads in that they are single use traps they take up one flat space on the ground, wall or ceiling. They deal out 150 damage when an enemy walks into, under or next to them and they are remain in the same spot for the rest of the game once placed. The hardest thing to deal with in Fortnite is getting unexpectedly killed after spending 15 minutes gearing up and getting great placement in the circle. It’s something that everyone has experienced when an opponent sneaks into your hideout and shotguns you from behind, it’s also something that spike traps can help avoid. When you make your way into any building for the first time be sure to place a spike trap on the ceiling in front of the main entrance. Build a ceiling if the original one is too high or not there at all. Do this before clearing the building since the trap will still remain if you die or decided to flee, and could even take out your assailant when he leaves. If you forgot to lay it on your way in a spike trap can be a nice way to get someone to stop chasing you for a few moments if you quickly place it on your way out as well. 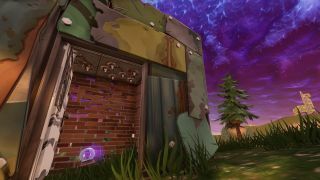 Little wooden, steel, and brick built shacks and towers will be a dime a dozen across Fortnite’s open fields and hills. Most of them will be the remnants of an old fight, someone making cover to heal, or staircases and towers made to traverse big obstacles. No one will think twice if they see weapons and items lying around a few walls. That also means they won’t check for traps. Placing a spike trap among a tower, insta-fort, or even a few independent walls can lead to an easy kill. The key is to make it blend it, build a couple walls or a box with an easy way to enter. PLace a weapon or item that can easily be seen from outside the structure and just wait for people to meander in. Whenever you know someone is pursuing you, whether or not you think you can handle the bullet exchange, use a spike trap as soon as they lose the eye line to you. The few seconds the take to either go around the trap or destroy it will give you time to reposition or escape. This works particularly well anywhere that’s not out in the wide open. Placing the trap on either self-built wall or a regular one will do. It may even take them by surprise and take them out for you.